1. Watch and Evaluate each other's PowerPoint presentations. 2. Present out PowerPoint Presentation to the class! 1. What number are you to present? 2. How do you feel about presenting to the class? 3. How long does your presentation need to be to get an "A" in presentation? 4. Open your POWERPOINT and look through it before we begin today. What is your favorite slide and why? As promised, I am at a meeting today. You are responsible for FINISHING your PowerPoint project TODAY! We will begin presenting on Thursday, October 29! Please stay engaged and be ready to make an amazing powerpoint presentation! Respect the sub and the classroom while I'm gone! I'm expecting a good report from each class! COMPLETE YOUR POWERPOINT PRESENTATION AND EMAIL IT TO ME! Go to MY DOCUMENTS, and open a folder called "22 - PPT PROJECT EXAMPLES"
Open the PowerPoint file called "22 - Example Luisa Soto"
2. Why would you give her this grade for CONTENT? 4. Why would you give her this grade for CREATIVITY? 5. If she presented all the slides completely in her presentation, but went over the time limit by 1 minute, what grade would you give her for PRESENTATION? 6. What did you like about this powerpoint that you can use in your own presentation? REMINDER: ALL MAKE UP WORK DUE BY THIS THURSDAY, OCTOBER 22 @ 4:30PM. NO EXCEPTIONS! 1. Overview the guidelines and requirements for your final PowerPoint Project. 2. View a sample project and grade it using the rubric provided. 3. Begin your PowerPoint project. See Page 22 for the answers to these questions. If you weren't here yesterday, pick up a handout from the back of the room. 1. When is the final Project due? 2. What 3 Criteria is the final project graded on? 3. What does your project need to have to get an A in CONTENT? 4. How long does your presentation need to be? 5. What is the minimum length of your PPT presentation? 6. What slide(s) would you like to work on today? Today's objective - Work on Slides 1 and 2. 15 Minute Ketchup: Work on finishing your CITY and/or your Sports Team slide. 1. Using the Drawing tools, create the object below. Group the objects into one. Copy and paste the object onto a slide 45 times. 6. Put your truck/vehicle on the road. - 2 Pictures of your favorite sports team. 1. Take a look at the picture above, what is this? 2. How many animations can you find in this? 3. What is the ORDER of the animations? 5. What is a DELAY? 6. Watch the PowerPoint that Mr. Aguda is showing you on the main screen. For each animation, tell me if they are on click, after previous (with or without timings), or with previous. Make 1 Slide about a DREAM CAR you would like to have when you get older. - 1 Text Box with 2-3 sentences describing WHY you like this car. 1. What are the 3 Start Properties? List all 3 and tell me what they do. 2. 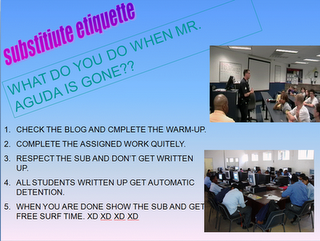 What are the procedures whenever Mr. Aguda is absent? 3. List your 5 Favorite Actors and/or Actresses (in order) and insert a picture of each one. I'm out sick today. I'm updating this blog from home. Today you will make a 2 Slide PowerPoint Slide show WITH animation and email it to me for credit! Please follow the agenda. It's very important that you treat the sub well, take care of the room and computers, and make me proud to be your teacher! Anyone written up by the sub will get DETENTION on the following day--no questions asked! 2. Email the Presentation to Me. Do this on PowerPoint, Don't Blog today.